The Will Miller Social Justice Lecture Series presents Hari Kondabolu, a brilliant comedian who addresses political issues which outrage him and cuts through the polite talk around race, gender and colonialism. Learn more about Hari @ harikondabolu.com or on Facebook. 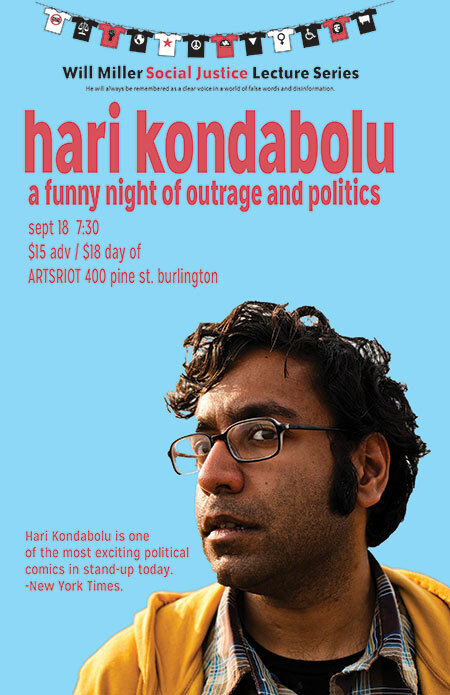 “Hari Kondabolu is one of the most exciting political comics in stand-up today.” New York Times. Hari Kondabolu is a Brooklyn-based, Queens-raised comic who the NY Times has called “one of the most exciting political comics in stand-up today.” In March 2014, he released his debut standup album “Waiting for 2042? on indie-label Kill Rock Stars. He is currently NYU’s APA Institute’s “Artist in Residence” for the 2014-2015 Academic Year. Hari has done standup on the Late Show with David Letterman ,Conan , Jimmy Kimmel Live, Live at Gotham and John Oliver’s New York Standup Show. His Comedy Central Presents half-hour television special debuted on the network in February 2011. He was also a writer and correspondent for the Chris Rock-produced Totally Biased with W. Kamau Bell on FX. In 2014, he was interviewed on Fresh Air with Terry Gross on NPR. A regular on the public radio circuit, he has also appeared on Morning Edition, All Things Considered, Studio 360, Bullseye and Soundcheck and Q with Jian Ghomeshi. He has also appeared on popular podcasts like WTF with Marc Maron, You Made it Weird with Pete Holmes and Too Beautiful to Live with Luke Burbank. In the UK, Hari has established himself with appearances on BBC 3’sRussell Howard’s Good News, Live at the Electric and Channel 4’s 8 out 10 Cats. He also performed at the Edinburgh Fringe Festival in 2011. He has also performed at such notable festivals as the HBO Comedy Festival, South by Southwest, Bumbershoot, Sasquatch, the Aspen Ideas Festival and Just for Laughs in Montreal and Chicago. When in New York City, he co-hosts the mostly improvised talk show The Untitled Kondabolu Brothers Project with his younger brother Ashok (“Dap” from hip hop group Das Racist) and their podcast The Untitled Kondabolu Brothers Podcast. He also wrote the cover story for Spin Magazine about Das Racist in November 2011. He was also a former video blogger for WORLD COMPASS, a joint initiative between WGBH Boston, PBS and the Corporation for Public Broadcasting. He attended both Bowdoin College and Wesleyan University, graduating from the former institution with a B.A. in Comparative Politics in 2004. A former immigrant rights organizer in Seattle, Hari also earned a Masters in Human Rights from the London School of Economics in 2008, writing a merit- earning dissertation entitled “Mexican Returnees as Internally Displaced People: An Argument for the Protection of Economic Migrants Under the UN Guiding Principles on Internal Displacement.” This is, by far, the least funny thing he’s ever written…including this bio. The WMSJLS brings speakers to the Burlington community to provide a continuing program of radical analyses of social, ecological and political concerns. The series is dedicated to Will Miller, Vermont’s activist philosopher and UVM Philosophy Professor for 35 years. This entry was posted on Sunday, September 7th, 2014 at 7:20 am	and is filed under Previous Events. You can follow any responses to this entry through the RSS 2.0 feed. Responses are currently closed, but you can trackback from your own site.